We are currently back in America on our third furlough and fourth term as missionaries to the Korean people and beyond. After graduating in 2003, the Lord led us back to the Independent Baptist Church of Anchorage, Alaska where we would soon find ourselves in an Alaskan village on our first full time missionary outreach. Late in 2004, I received a call from Korea with a request to return and pastor the church where I was saved in 1995. We believed that to be the Lord’s direction, raised a few hundred dollars a month, and left for Korea in September of 2005. We served there until 2007, when the Lord had us return to begin full-time deputation to reach the Korean people. We finished deputation in 2010 and returned to spend some time with our home church in Alaska before going to Korea. Since January 2011, we have had an incredible opportunity to reach the Korean people and beyond. Since our first prayer card in 2005 we have always had “and beyond” as part of our ministry. This has manifested itself in many different ways. We have had opportunities to work with American military, Korean military, International ministries, and fully Korean ministries. God has opened the door to be able to get into the Korean prison system as well which is an amazing opportunity considering we are foreigners in that land. In 2014, the Korean government redefined missionary status and no longer allowed for people with a missionary visa to be the single pastor of a Korean church. This led us to turn over the church to a national pastor and move north to work with another missionary. Thus allowing for us to begin travel in Asia. During that time, we have traveled to nine different Asian countries which has now become our “beyond ministry.” We have been able to work with other missionaries in these areas reaching the locals as well as searching for “Koreans” who have been displaced. Some of these regions are restricted and therefore not a lot of information can be given. However, along with our regular ministries in South Korea, there has currently been one church started and three others awaiting a pastor. We just received word that a young family has surrendered to go to this area to work with these congregated believers. At this time there are thousands of pieces of literature going into these restricted areas on a regular basis…please pray that God’s Word would have free course. As for the family, Kristin and I have recently celebrated our 21st anniversary. Since our last visit we have had two more children, Jonah (7) and Jesse (5). Abigail (20) is currently pursuing a birth professional degree and in so doing, needs to be a part of two births. When she left Korea last year, she did not know whether she would have an opportunity to return to Korea. The Lord has worked it out that one of her required births would be in Korea helping our good missionary friends with the birth of their seventh child. She was absolutely overjoyed to return “Home” for this opportunity. Joseph (18) has surrendered to missions under the preaching of a missionary to North Korea. He is currently pursuing an Engineering degree to possibly facilitate entrance into an Asian country. Jonathan (16) has surrendered to preach and has had several opportunities since we have been back. Vivian (15 in December) and Joshua (13) are an active part of our furlough ministry. We are planning to return next year to South Korea and we are currently praying about two different areas to begin our next church plant. If you would like more detailed information on our “beyond” ministry, please feel free to ask. This is a wonderful family, very disciplined and a heart for God. 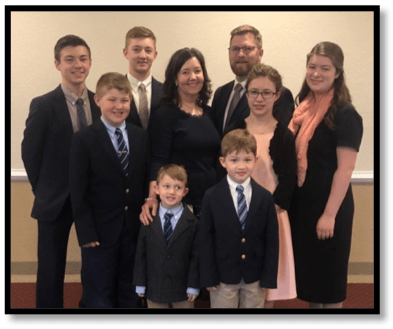 We attend their home church, the Independent Baptist Church of Anchorage, have worked along side of them, watched the disciplined life hard work, short finances and a giving spirit. We have the highest regard for their integrity to the mission field. Praise the Lord for His faithful provision and your your faithfulness to GO beyond your comfort zone. Your family is a wonderful example of how families can and should, serve the Lord. May he continue to bless each of you as you continue to follow His leading.